In Jackson, I stayed near the Jackson Hole Mountain Resort. 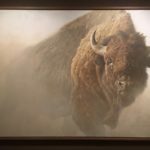 This lies a little more than 10 miles to the northwest of Jackson and due south of Grand Teton and Yellowstone National Parks. For my next visit, I’ll definitely plan to stay within the parks, but now the campgrounds (and running water) are beginning to close. With the prospect of snow and no showers, I decided to book a stay indoors. Jackson, Wyoming is also called Jackson Hole. For a visitor, this can be confusing, but Jackson Hole is apparently the 80-mile-long valley in which the town of Jackson is located. It’s a town I felt at home in. With about 10,000 residents, it’s about the size of my area in central Vermont. The downtown is walkable – and a bit kitschy – with hotels, a sushi bar, restaurants, a bar, coffee shops, and several historical museums. The main square is also beautiful, with four large arches on each corner made entirely out of elk antlers. At first, I was a little nervous about how the town (or the artist/builder) came to possess so many antlers, but I soon discovered that elk naturally lose their antlers every spring. Phew! The crown jewel of Jackson is an extremely well camouflaged National Museum of Wildlife Art. At this time of year, the architecture of the building blends in seamlessly to the beige, brown, and gray landscape. The building is situated on a cliff overlooking the National Elk Refuge and has many sculptures on the property to explore and appreciate. 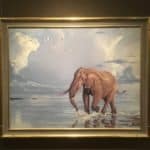 The National Museum of Wildlife Art is one of the most impactful museum’s I’ve been in. The pieces are singular and meaningful, the facility is warm and rooted, and the “25 Fables: Aesop Animals Illustrated” exhibit is clever, lighthearted, and worth detailed scrutiny. 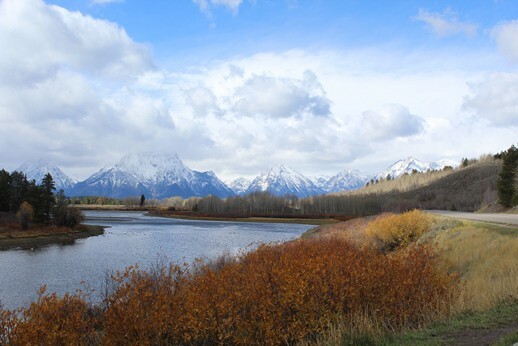 Back outdoors, Jackson is just 5 miles from the edge of Grand Teton National Park and 80 miles from the edge of Yellowstone National Park. Since it was frigid when I traveled through both parks, I didn’t do any hiking in either. But the views and the visitor centers certainly whetted my appetite for the next visit. Here’s the breakdown, though: visit Yellowstone because of Old Faithful and the Paint Pots and because it’s an iconic national treasure. But do not skip Grand Teton – that’s where the mountains are, which remind me so much of the “wild west” vision I had in my imagination. While in Yellowstone, though, I met someone at Old Faithful. I arrived on a cold morning, slightly under-dressed. There were few other people near Old Faithful. I looked up details on my phone and realized I could be waiting as much as 30 minutes. While pacing to keep the blood flowing, I saw an older man doing the same. He had on a decent coat, but no gloves or hat. Soon, we started pacing near each other and made a few comments on the time and weather to each other. Eventually, I got more of his story. Fred is from Holland and lives there now, but he also lived in Montreal for 35+ years. 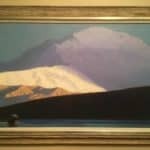 He was on a road trip, like me, for 10 months, although his route was nearly the reverse of mine. Fred told me he’d always wanted to take a road trip like this with his wife. He thought he’d wait until retirement to do this kind of epic adventure, but his wife was diagnosed with Alzheimer’s. Looking back, he can trace its beginnings to more than 20 years ago. They just thought she was getting older and more forgetful. By the time Fred retired, she wasn’t interested in traveling and eventually couldn’t. She passed away, I think, last year. Fred’s story taught me two things: if you want to do things with loved ones, do it now. And if you find yourself on your own, do it anyway. 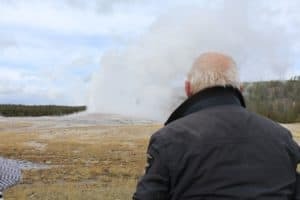 When Old Faithful finally blew, tears came to my eyes and spilled over. Despite how well-known some of these national parks are, they still move me deeply, emotionally. I was standing at Old Faithful, far from home, like Fred, watching the earth do an odd and magnificent thing. Jackson, Wyoming was one of the most beautiful places I’ve seen in the United States. I look forward to at least a few more adventures in this wild west adventure epicenter.